Penberthy's MULTIVIEW™ Magnetic Liquid Level Gages can be built to serve practically any process industry situation. From the simplest operation to the most severe, corrosive environment, Penberthy can construct a system to best suit your company’s requirements. 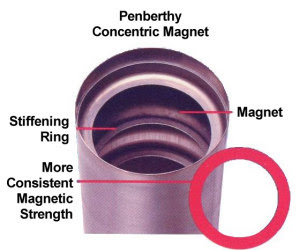 As pioneers in magnetic gage level indication and as creators of the unique concentric magnet design, Penberthy has the expertise to know what design, specifications and options best fit any given application. Contact a Penberthy representative to discuss specific duty requirements in your operation. 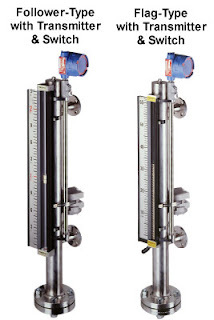 MULTIVIEW™ Magnetic Liquid Level Gages utilize a communicating chamber constructed of 2-1/2" pipe which is connected to the process tank with either side or end connections. A float with a self-enclosed magnet is custom sized and weighted to float at the surface of the process liquid to be monitored. The float is then installed in the communicating chamber. The industry-unique concentric magnet in MULTIVIEW™ gages provides a more consistent magnetic field than conventional magnet designs. In MG Follower-Type models, the unit consists of a hermetically-sealed tube in a protective view housing. Within this tube is a gold anodized aluminum follower which will mirror level changes in the process tank. This entire assembly is attached to the communicating chamber where the follower is magnetically coupled with the float. Because the follower and float are magnetically linked, liquid level changes in the process tank will cause both float and follower to rise and fall in unison. The result is a precise indication of the liquid level within the vessel. MG Flag-Type monitors provide a more secure link between the indicator and float. The view housing is sealed and consists of a single column assembly of aluminum flags within an extruded aluminum channel. These flags are anodized with black on one side and gold on the other. Each flag houses a small magnet and is assembled on a single, individual axle. As the float in the communicating chamber rises and falls, the magnetic interaction between float and flag magnets cause the flags to rotate 180°. These changes are shown through contrasting colors – black above and gold below the liquid level. To insure trouble-free operation, Penberthy's flags are magnetically interlocked and utilize mechanical stops. This prevents over-rotation. Penberthy's redundant axle system prevents binding, with each flag allowed to rotate on the axle and each axle free to rotate in the channel. This method of indication is always accurate, regardless of the speed of process level change or vibration. Switches can be added to the level gage for point level control. MGS Switches provide non-intrusive point-level control and contain no mercury. They allow you to be environmentally safe without sacrificing accuracy. MGS-314L: SPDT 1A service used with standard MULTIVIEW? Transmitters can be added for continuous level control. MGT Transmitters provide continuous level indication to remote locations via 4 to 20 mA loop-powered operation. MGT-362B or C: An in-tank reed switch based unit. The MGT-362B is an NPT-mounted assembly. The MGT-362C is a flange-mounted assembly. Both are available in integral or remote mounting styles. MGT-367: A magnetostrictive transmitter available with or without Hart protocol. Please visit our web site and fill our our Penberthy form for more information. Flow Factor sells products to control media in flow situations, tanks and pipes. These products include solenoid valves, pressure switches, temperature switches, level control and switches, gauge, jet pumps and flow switches and monitoring. Some of the products sold are ASCO, Parker, Ametek, Erdco, Penberthy, Process Technology, US Gauge, King and Robertshaw. Rating the valve capacity in terms which apply to all operating conditions is accomplished by determining the "Flow Factor" (Cv) of the valve. The Cv value is the number of U.S. gallons of water at 16°C (60°F) per minute that, when flowing through the valve, causes a pressure drop of 1 PSI. There are five main parameters to consider when selecting a valve: Cv, media compatibility, pressure, temperature, and process fitting. The flow factor or Cv can be very important in valve selection. The Cv can be used to compare valves to insure similar flow capacities. Our Jet pumps or Eductors can be used to mix, heat, and pump medias without electrical power. Site flows are used to give a visual indication of process flow. Gauges are used to measure and give visual indication of temperatures, flows, and pressures. Level control is used to monitor and measure levels in tanks and vessals. Ametek-U.S. Gauge - U.S. Gauge is one of the world's leading suppliers of high quality, competitively priced pressure and temperature measurement products. Founded in 1904, USG's product offering includes bourdon tube and diaphragm capsule pressure gauges ranging in size from 1-1/2 inches to 6 inches; with brass, stainless steel, alloy steel or Monel internals. ERDCO - ERDCO® offers a complete line of flowmeters, sight flow indicators, flow transmitters and flow indicating switches. We employ elegantly simple measuring technologies with proven reliability in utility fluid applications. King Instruments - King Flowmeters provide exceptional performance in a wide range of industrial, commercial and specialty applications. King offers more styles, sizes, features and options to satisfy all your rotameter requirements. 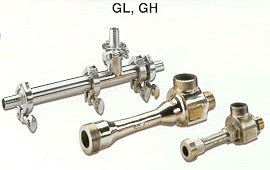 ASCO General Controls - Solenoid Gas Valves, including Pilot Gas Shutoff Valves and Main Gas Shutoff Valves; Solenoid Oil Shutoff Valves; Hydramotor Oil Valves and Hydramotor Gas Valves. Barksdale - Barksdale offers both mechanical and electronic pressure, temperature and level instrumentation solutions for all industrial applications. Process Technology - Manufactured in an ISO 5 (class 100) cleanroom, these products include: UPDI water heaters, inline fluoropolymer and quartz chemical heaters, a large selection of fluoropolymer chemical bath systems, solvent heaters and nitrogen heaters. Semi S2/S3 and CE compliant; ETL/UL certified. Robertshaw - Robertshaw offers RF capacitance level control technology for virtually any substance in any type of vessel. Solid state, digital designs offer on/off and continuous level measurement in all types of vessels. Using the power generated from the process, Robertshaw self-actuated regulators are simple, complete control units built to the highest quality specifications to assure satisfactory service for many years.